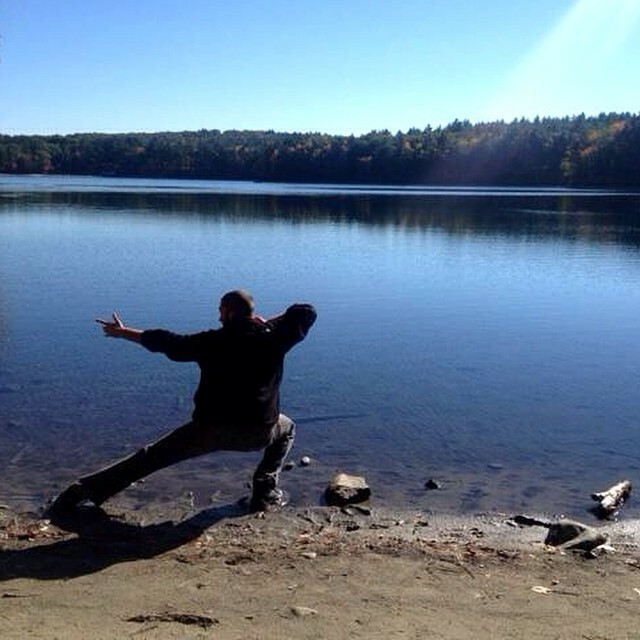 This past Columbus Day weekend, I visited Walden Pond in Concord, Massachusetts for the first time in nearly three years with a few good friends to hike and enjoy the outdoors on a beautiful autumn-y weekend. Walden was a place that I would often visit while I lived in South Boston from 2010 to 2011. I used to love taking the drive to Concord and hiking around the deep blue pond and its surrounding quiet. I’d take occasional pauses along the walk to read a good book, or just soak in the trees and breeze. Preparing for my first trip back to Walden since, I opened my old copy of Walden to re-read Henry David Thoreau’s thoughts on his 2 years and 2 months of living there in the 1850s. What always catches my attention when I re-read Walden is how the American transcendentalist strikes the tone of the beauty, promise and importance of his mornings at Walden Pond. The mornings are not just a time to wake from sleep. Mornings are when we wake to our inner truth, our souls–the “God” within each of us. Mornings carry an energy of truth and innocence. It’s because the morning represents our birth. Your birth. Not just the birth of a day, but your birth, all over again. Thoreau wanted to tell us that there is magic to be found when we realize this. Each morning symbolizes your life, renewed and beginning again. Each morning is an entire opportunity to be born again and live an entirely new day in a new life, a new lens, almost as if an entirely new body. When we recognize the magic of morning, we discover not only an aura of truth of a day; we discover an aura of truth about ourselves. Every morning is a new opportunity. We swim in these repeating cycles, day after day, year after year. The hands of the clock swirl in circles. The earth rotates circularly on its own axis while gravitating around the sun, another circle, as other planets, all circles, rotate around that same sun. We count our years with each full circle. We wake up, live and sleep in circles. In yoga, we call these cycles “vinyasas.” A vinyasa is a cycle that carries a beginning, middle and end. A vinyasa has its own flow–a rhythmic sequence, a natural unfolding. In a yoga practice, we experience vinyasas over and over again. A vinyasa is a cycle that closes one part of the practice and opens a new sequence. Vinyasas give us closure to the past cycle and refresh our attention to a new cycle that is beginning. We’re lucky to have so many chances to start again, and each morning is the first chance that we have every day to begin fresh and new. At daybreak, we are each given a new chance to live well, to be our truest Selves, and to do what our hearts call for. Mornings are magical. Thoreau says as much in Walden. They are a time that we awake to our inner Genius. Our truth. God, within. Every morning, we are given new opportunities to choose, honor, open, awaken and commit. Honor new beginnings and endings. Honor the new cycle of the day by closing out an old habit or unconscious routine. Start slow. A rushed and frantic morning means a rushed and frantic energetic frequency throughout the day. Slow down. Breathe. Commit to what you say you want. What better time than morning, having awakened to your genius, to write, create, flow in yoga or honor some “truth” to yourself? Commit in a little action to what you say you want. Get it done before the commitments of the day begin. Put your health first. Honor body. And, in doing so, honor mind, heart and soul. How do you “wake” to your truth every morning, my friend?